14 gauge steel, (2.3 mms or .09 inch thick). This heavy-duty, Viking-styled helmet, has several features taken from an authentic Viking helmet, including a spherical crown with a reinforced central ridge, and a simple yet effective 'spectacle' style guard. Crafted from quality 14 gauge steel, and an adjustable leather liner, as well as leather chin straps for secure and tight wearing. Viking helmet was excavated on a farm called Gjermundbu in Ringerike in central Norway. Gjermundbu is located in Haugsbygda, a village in northeast of Hønefoss, in Buskerud, Norway. 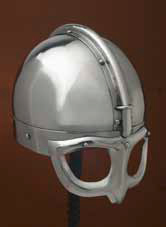 The helmet dates to the 10th century. This page was last modified on 25 October 2013, at 10:19.